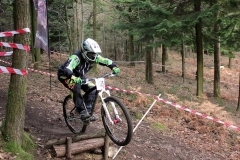 Delivered by British Cycling qualified coaches, Dirt Bike School delivers mountain bike coaching sessions to riders of all experience and ability. We aim to develop mountain bike skills that can be used to improve bicycle handling and benefit trail riding, DH performance, social riding, uplifts, cross country and more. To maximise rider progression most sessions have more than one coach. Sessions are organised for different abilities and experience, with women’s specific sessions structured in the same way. Race School: If you are a competitive cyclist , DH,XC, Enduro, Fourcross, or CX then contact us to discuss how we can develop your performance either through individual technique development or training plans. All groups develop the range of off road cycling techniques. We use the Carrick Riders Fourcross track in Falmouth to develop skills that can be used for leisure and social riding as well as in competition. We also develop and apply these skills further in more natural environments such as Poldice Valley, Unity and Idless woods. 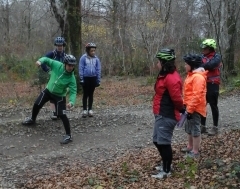 We are keen and happy to coach in different settings and happy to deliver a session for a group on your local trails. If you have a specific need or want to book individual coaching then please call or email to discuss what we can do for you. Price and booking: Our standard rate is £20 per rider in a group coaching session. Discounts apply to the number of sessions booked in advance. You can pre book dates or buy a number of sessions and inform us of attendance (subject to availability) 48 hours before the session. To secure your place in a session we will email you a PayPal funds request for a £10 non-returnable deposit. To help us plan a suitable coaching experience riders are asked to complete information and consent forms when registering to be coached.